A night with caviar, A5 Kobe, and the best view of the fireworks. The most stirring part of our experience at 21 Royal didn’t involve golden osetra caviar and Alaskan king crab, or A5 Kobe pastrami, or Santa Barbara spot prawns, or beautiful wine pairings. All of that was excellent and totally in the stratosphere of the country’s finest tasting menus, including those we’ve had at some three-Michelin-starred restaurants. But what we’ll remember most is that feeling of childlike wonder we had on the 21 Royal balcony after dinner, watching the Fantasmic! show and the fireworks while standing above a sea of humanity. Fantasmic! is full of rousing moments, and there we were at this private Disneyland perch, yelling and smiling and gasping like we were on the field at the Super Bowl or in the DJ booth at Electric Daisy Carnival. One of the most dramatic moments was when Mickey battled a dragon, and one of the 21 Royal dinner guests, a grown man, started screaming: “Get him, Mickeyyyyy!!! Get him!!! Yessssssss!!!! 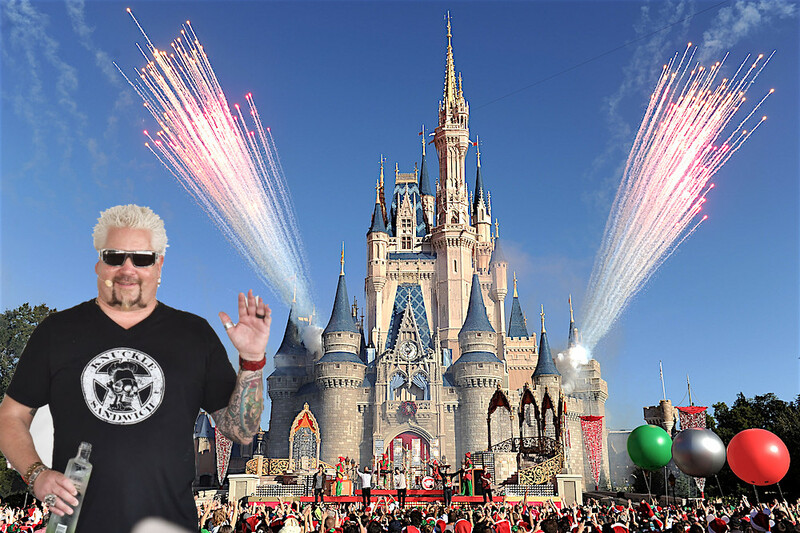 !” And then, when a ship of Disney characters cruised in after Mickey’s stunning victory, the bellowing from the balcony got even louder: “It’s everyone!!!!!! Yessssssss!!!! !” We were giddy, swaying, bouncing, so happy to be so hype while experiencing something so magical. A lot of tasting menus leave you exhausted after you’ve dined for a few hours: You’re yawning and looking forward to putting your head down on a pillow. By contrast, eating at 21 Royal (which debuted in 2017) and doing Disneyland like a VIP energizes you and makes you never want to go home. We were picked up at the Grand Californian Hotel & Spa around 5:30 p.m. At 10 p.m., we still wanted to linger at 21 Royal before going to ride Splash Mountain nearby. So we guess the point we’re making is that 21 Royal, a private-dining experience that costs $15,000 for 12 people, is expensive but offers you a lot more than dinner. Let’s break it down. The bold type below is from Disney, and everything else is our description of the experience and value involved. These tickets, depending on when you visit, will usually run you $147 to $185 per adult. The tickets get you inside both Disneyland and Disney California Adventure (where you can eat your way through the new Pixar Pier). There was a team of people dedicated to our comfort. We were greeted with ice-cold towels. After dinner, the ladies in our group who wanted to explore late-night Disneyland were given Rollasoles to keep their feet pain-free while they walked. A head butler who did double duty as the ”chief fun-maker” made whiskey-based Royal Street cocktails and gin-based Lilybelle Sours. We enjoyed ahi tuna on compressed potato, fava bean fritters with tahini, and duck confit cigars. 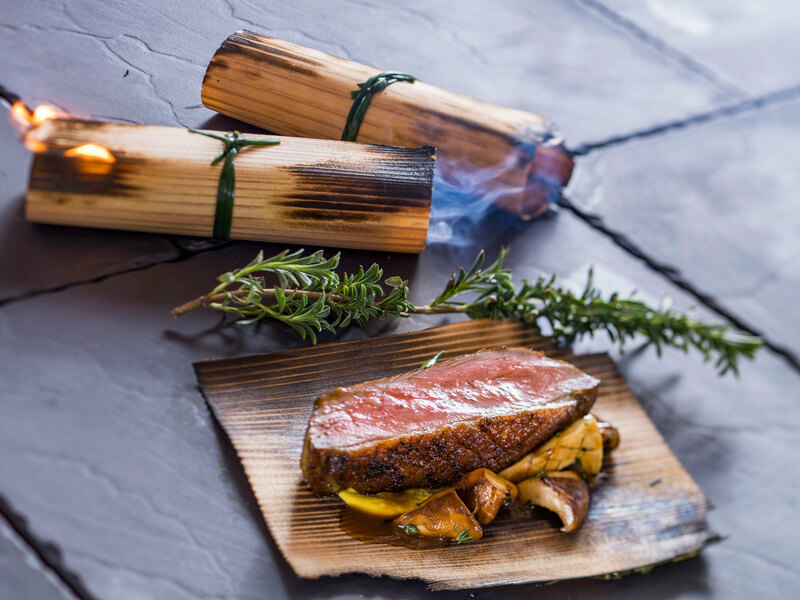 The food at 21 Royal, where executive chef Sutton has delighted guests with dishes like duck breast on roasted cedar and hamachi with avocado and citrus, changes all the time. 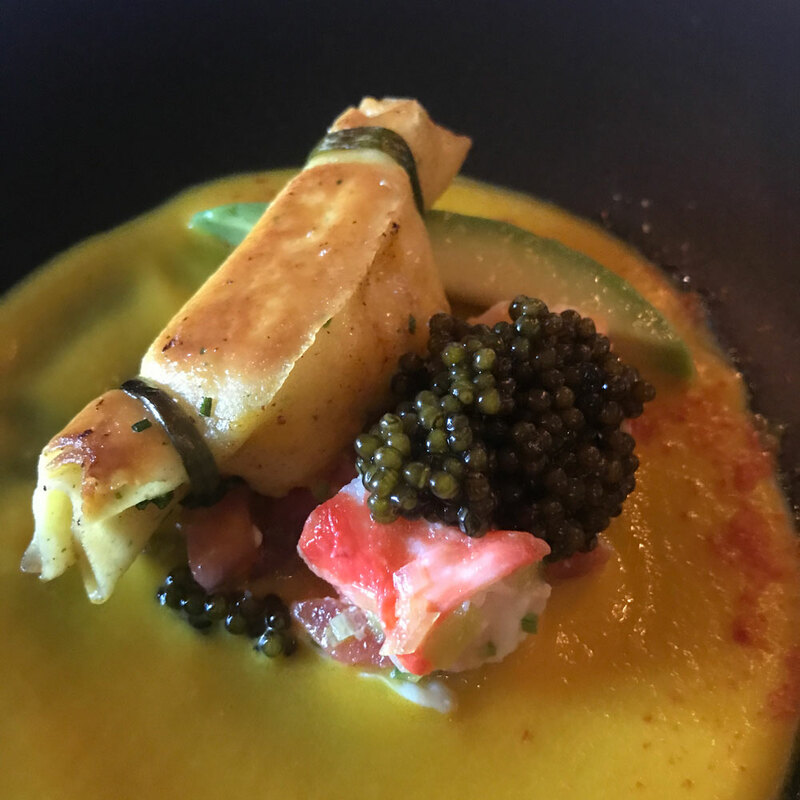 On the night we visited, the dazzling dishes started with String of Pearls: golden osetra caviar with Alaskan king crab and heirloom tomato. A-5 Kobe pastrami, a dish Sutton served for the first time and named The Process, was the result of realizing that this ultra-premium Japanese beef would be an exciting ingredient to accompany pinot noir. (Ellingson selected a 2013 Freeman Winery Gloria Estate pinot noir from Sonoma’s Russian River Valley for this course.) Sutton’s preparation of the beef solved a problem you often get with A-5 Kobe, which is so marbled that it can end up being too fatty for a lot of palates. Sutton did a “soft cure” of the beef, which took about eight hours and “washed out some of the greasiness.” He then cooked the A5 medium-rare. The result was something spectacular that resembled both pastrami and steak without being overwhelmingly rich. Sutton and his team are always ready to accommodate requests and restrictions: He writes a vegetarian menu every night just in case. He’s made fresh beignets, tomato soup, and grilled cheese for children. He once shaved Périgord truffles to satisfy one kid’s craving for truffle mac and cheese. This part is a lot of fun. One dish we loved, known as A Walk with Wonder, featured Santa Barbara spot prawns, red abalone, Kona kampachi, and uni “sea splash” foam. The dish was inspired by tide pooling, including outings when an eight-year-old Sutton visited his scuba-diving grandfather in La Jolla and also recent days Sutton has spent with his daughter, who’s attending the University of Hawaii. Tide pooling is often about waiting around to see what happens. It’s about soaking up everything around you and not worrying about what else you need to do or where else you need to be that day. “The point of the dish is trying to create presence, and trying to be present,” Sutton said. It’s a dish that’s about memories but also about right now. There’s a team of foragers who find ingredients for 21 Royal, so chef Clint Chin (who works closely with Sutton on the tasting menus) told us that a dish called Sunlight Through the Pines with roasted chanterelles, cèpes, morels, and Brentwood summer corn “pillows” was inspired by the process of foraging. Depending on what foragers find, dinner at 21 Royal could include ingredients like “elephant-toe” barnacles, Buddha’s hand citrons, and matsutakes (which Sutton wants only when they have a closed veil that results in the deepest aroma). Ellingson shared the story of trying two dozen wines before he decided to masterfully pair the spiciness of a banana-leaf roasted pheasant/coconut-tomato curry dish (known as Razor’s Edge) with a 2011 Tommaso Bussola Amarone della Valpolicella Classico from Veneto, Italy. This dish, which included fiery chutney and mango with yogurt, had a lot of nice things going on and the wine went well with all of them. For the final savory course, Sutton, who’s lived in Texas, Colorado, Alaska, and California and whose credits include seven years as executive chef of Napa Valley’s Auberge du Soleil and five years with Dean Fearing at Dallas’ Mansion on Turtle Creek, created something called The Mighty West. This dish of American buffalo tenderloin and a little piece of tongue featured “brambly aromatics” (inspired by living in Napa and how “the sun hits the wild blackberries” and “the flavor of the hillside”), marionberry relish, and hay-roasted roots. “I hope you felt a sense of place with every dish,” Sutton said. We definitely felt it. We were at Disneyland, but we were also somewhere else, where dessert was a summer peach melba cloud. Unique opportunity to enjoy entertainment from the balcony overlooking Rivers of America. On many nights, the shows are Fantasmic! and the Disneyland fireworks. So, as we mentioned at the top, this is perhaps the most priceless part of the whole night. It’s an exclusive experience, sipping tea, coffee, or after-dinner booze at this VIP viewing area, directly above café tables where people have bread bowls, chicken fingers, and fries. But it’s also communal. We’re all on your side, Mickey. Get him, Mickeyyyyy!!! The dinners at 21 Royal typically happen on Thursdays, Fridays, and Saturdays. Some other days might be available upon request. The $15,000 price is all-inclusive, including tax and tip. For booking, call the concierge at 714-300-7749.